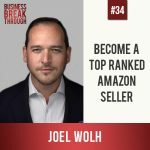 Joel Wolh is not only a top ranked Amazon seller, but he has hacked the code to help anyone get top ranking on Amazon, which today is almost a guarantee of success for any product-based business. In this episode, we pull back the curtain to see the inner workings of the Amazon platform, how it has changed over the years and how someone today can leverage Amazon ads to build and grow a successful e-commerce business. We also talk about the struggle that many entrepreneurial minds face of short attention spans and constant growth seeking. Tune in to hear what happens when you grow too far, too fast and how to grow your business fast without using up your limited bandwidth.